It is the policy of the United States to safeguard the health and well-being of the American people during the 2009-H1N1 influenza pandemic by: (1) taking action to slow the spread of disease, mitigate illness, and prevent death, and (2) sustaining critical infrastructure and minimizing the impact of the pandemic on the economy and functioning of society. Support of State, local, territorial, tribal, and private sector pandemic preparedness and response activities. This plan establishes general guidance and directs USDA Mission Areas, Agencies, and Staff Offices to ensure that their Pandemic Plans meet the requirements identified in subsequent sections. Administrators and Office Directors will assign action officers to review and update their Agency and Office Pandemic Plans and ensure that local operating plans for each field facility are similarly updated. The second wave of the 2009-H1N1 influenza (hereinafter: flu) is due to begin late summer/early fall. Accordingly, all plans should be complete by September 15, and should be revised in a timely fashion as new guidance is issued. To ensure a unified response in the National Capital Region, Departmental Administration’s Office of Operations will oversee the development of the local operations plan for headquarters locations with input from the Mission Areas, Agenicies, and Staff Offices. 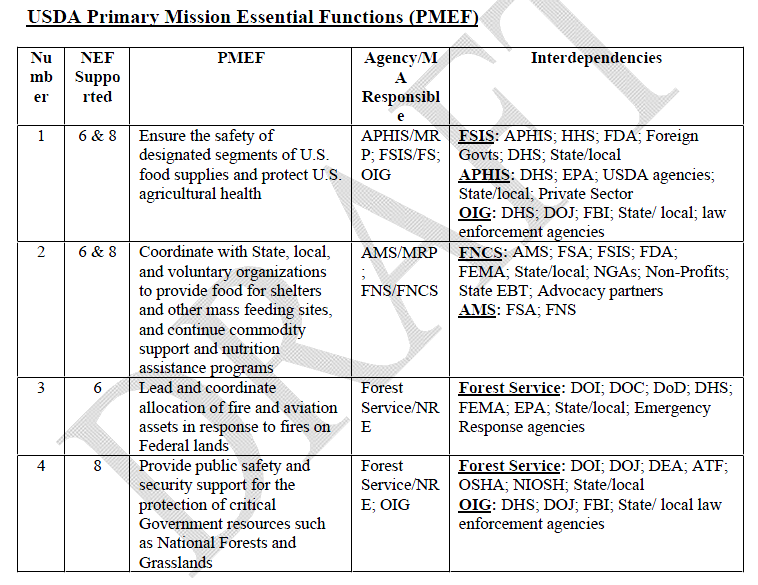 This document uses the term Continuity of Operations (COOP) in its broadest sense of USDA preserving the capability of USDA to perform its mission, and should not be confused with the USDA HQ COOP Plan, which provides guidance related to national security events which may require relocation of essential personnel and functions. The scope of essential functions and services in pandemic planning is much broader than the essential functions identified for traditional COOP, specifically with regard to the pandemic planning requirements to sustain operations for an extended period of time and to accommodate a loss of human capital versus a loss of infrastructure. 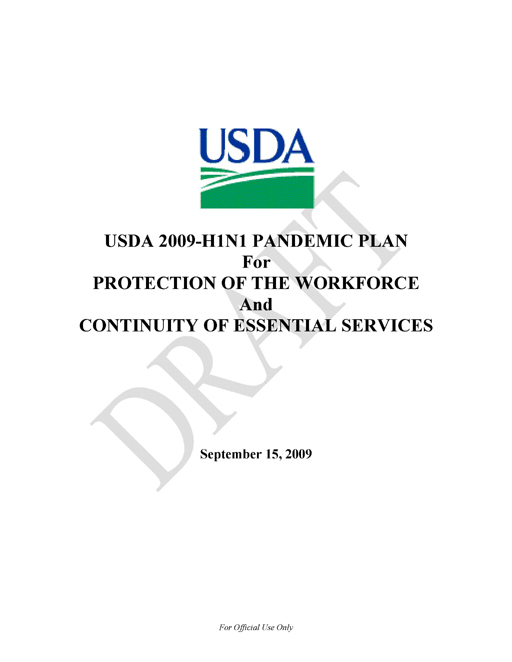 The following is a synopsis of the USDA 2009-H1N1 Pandemic Planning Guidance Checklists and Annexes. Human pandemic influenza is likely to come in “waves” of several weeks to a few months in duration. The Second Wave (expected in Sep 2009) is likely to have greater impact than normal seasonal flu. A vaccine will not likely be available until after the second wave peaks in mid-October and may make for a larger second wave with 10 times the number of medical visits and 3 times the number of deaths than we would see from a regular mild to moderate seasonal influenza. This may equate to 90,000 to 100,000 deaths in the United States. As of mid-July there is still insufficient evidence to predict the severity of H1N1 when it returns in the fall. Attack rates will likely be 25-30% with children. Middle age adults are presenting with illness disproportionately from seasonal influenza which usually strikes the very young and very old. Some persons will become infected but may not develop clinically significant symptoms. Asymptomatic or mildly symptomatic individuals can transmit the infection and develop immunity to subsequent infection. At the height of the second wave, absenteeism is likely to be closer to the 20 to 30 percent range similar to the attack rates seen so far. (Factors include that since the virus has a low lethality, there will be less reluctance to report to work—assuming the mortality rate remains consistent with seasonal flu. There may be a higher infection rate than seasonal flu because a significant portion of the population is still getting the flu during non-flu season. Hence there is a greater number of infectious people to spread the disease once climate changes make the spread more conducive. There is also a higher incidence of people in the work force who are infectious (as opposed the children and older aged individuals. Illness among the public and absenteeism in the private sector workforce may impact essential functions and services needed by USDA customers, the ability of USDA contractors to deliver goods and services, USDA’s ability to procure needed supplies, and distribution systems. We do not believe the impact will be as severe as in the Avian Flu scenario. Community mitigation guidance for school closures has not been finalized by CDC yet. This could have a significant impact on absenteeism from primary caregivers staying home with both sick and well children. Assuming the current flu does not change, a vaccine will not be available until the peak of a second wave in mid-October. The stockpile of anti-viral drugs has been greatly expanded in the last few years but this assumes that a new variant does not appear that is resistant to current anti-virals. Influenza is spread through droplets from an infected person. USDA planning must recognize that viral transmission occurs as much or more through touch (contact with contaminated objects) as through air dispersion (through coughing or sneezing). Persons contracting the virus will be infectious for a period of time before the onset of symptoms, during the illness, and for a period of time even after symptoms have disappeared. USDA will follow Health and Human Services guidance on medical issues and amend its actions as necessary based on new guidance. 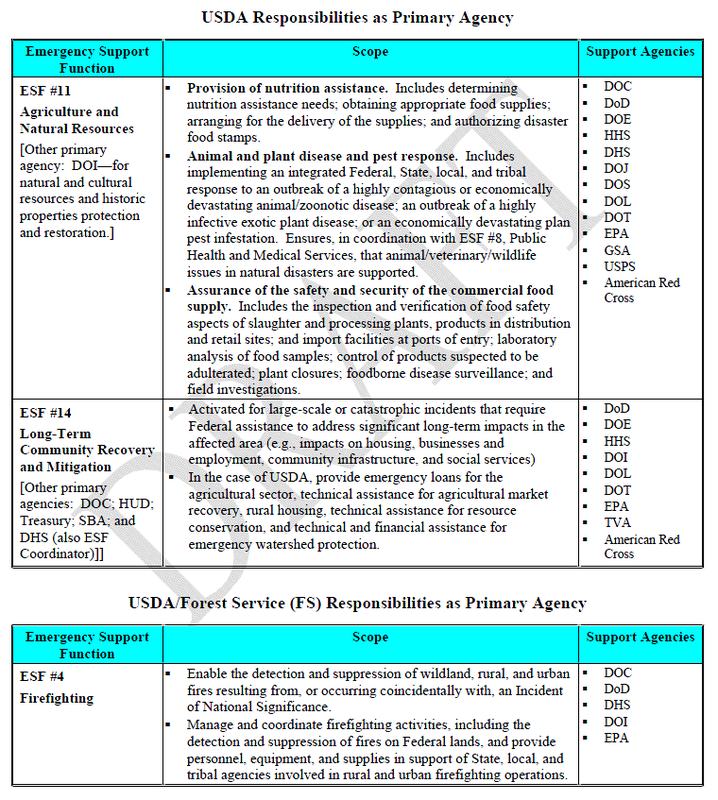 A brief overview of USDA primary and support responsibilities, under annexes to the NRF, is presented in the following three charts.